How do you choose the best log book loan? Loans of any type are very much a personal choice. One of the most popular loans at the moment are log book loans. But there are lots of different log book loans available to choose from in the marketplace right now and that can make it a tough decision. So how do you go about choosing the best log book loan? Just like any other loan, what will suit some, might not suit others, when it comes down to the benefits, advantages and terms of the loan itself. But much depends on how the loan companies market themselves in order to win your business. TV, radio and print ads for loan companies are commonplace these days and each one is designed to grab your attention with snappy soundbites, catchy jingles or bold headlines. So what should you look out for and how do you cut through the noise of the media to find the lenders that genuinely will offer you the best log book loans? Like many things in life, if something sounds too good to be true, it usually is. No matter how convincing any loan advert is, they're intended to tempt us into signing up. But it can be a dangerous game to play. Often, the bold statements that persuade us in the first place come with lots of 'small print' that tells us quite a different story. It's true that many of us don't read the terms and conditions that come with many of our purchases. Whether it's downloading the latest update for your smartphone or applying for a loan. We just accept that it's all good, that it protects us and gives us the benefit of the doubt if anything goes wrong. But more often than not, it's also where companies like to bury the things they don't want to tell you up front about. Many companies will try and gloss over any of the terms that might cost you more money, beyond your standard repayments. Many will try and baffle you with financial jargon that makes it sound like you're getting a pretty good deal in order to get you to sign on the dotted line. And when you do sign, you might think you've got a pretty good deal too, but the devil is in the detail. Some of the most common things that more unethical log book loan companies won't tell you about are the things that will make them more money. Hidden fees and charges are often a lucrative sideline that companies will claim straight away and add on to your existing debt, without first understanding your own financial issues. And although more prominent charges like a 'late payment charge' might seem a bit obvious, it's not the fact that they impose the penalty itself, but rather they might hide how much it will be. As well as neglecting to mention it at the point of application. So if you're late with a payment even by half a day, you could discover a hefty charge has been imposed. Other stealth charges that probably won't be brought up when you apply can include charges for contacting you - even sending you a text message. You can probably imagine receiving a text telling you that your payment is due and thinking that it's a helpful reminder so you don't get a late payment penalty. Little do you know that you're actually being charged for the privilege. So while there may be something a little underhand in the way they go about implementing many of these charges or opting you in by default to SMS messages, they're not illegal. But the very fact they're hiding them from you, and not telling you up front when you apply for your loan, should ring alarm bells. Another potential revenue stream for many loan companies is their policy on you settling your loan early. Many of us take out loans with the expectation of paying a certain amount back each month for an agreed number of months. However, many log book loan lenders will impose a minimum period before they will consider an early settlement - in some cases, up to three months. We all know how quickly personal circumstances can change. So while you might take a loan to get you through a financial rough patch, things could change relatively quickly. You may find yourself in a position to pay off the loan completely, sooner than you think. So why would a loan company not allow you to do this? The answer is, that it's another source of generous income. Even though you are able to pay off the loan, by not letting you do so means extra income for the loan company through interest charges. Not only does this happen, but lenders could also add a slice of future interest on top of the amount you pay off. This is nothing more than a stealth charge and an unfair penalty to you just for ending your loan earlier than agreed. There could also be times during the life of your log book loan where you can afford to, not pay off the whole loan, but make overpayments from time to time to clear your debt sooner. This may only happen once or twice, but it's a good way to reduce the life of your loan if you can. But, many log book loan lenders will continue to charge the same amount of interest, despite you having paid more off the loan itself. A reduction in interest, however slight, would make paying back your remaining loan that much easier to handle. Why would lenders not charge a reduced amount of interest on the lower balance that's left? It's another way to boost their profits at your expense. So you can see how some of the more underhand log book loan companies will prey on the vulnerability of some people at, what could potentially be, a difficult time financially. Fortunately, not all log book loan companies will attempt to hide key facts or policies, or make you pay extra when you don't need to. Our examples throughout this post highlight just some of the issues that ordinary people can face when they pick the wrong log book loan company. So when you're looking around, remember to research those key points and it should help you make a more informed decision. And one more area to look out for is the rate of interest being offered. Some companies interest rate can be almost double that of others, so that's definitely worth looking out for. When it comes to researching the best log book loans and finding which one suits you the best, it can take time. But, because of the amount of log book loan lenders out there, it can be a confusing task trying to work out which one can offer you the best deal, as well as one that suits you too. One of the best log book loan lenders in the UK is Car Cash Point. Having almost a decade of experience in giving people a flexible loan when they need it most, they've helped thousands of people release the cash from their cars in that time. 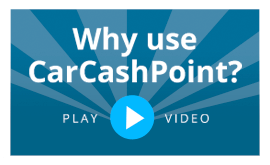 So what can Car Cash Point offer that many other lenders simply don't? Well, there are no hidden fees or charges. Through award-winning customer service, great care is taken in being totally up front, open and honest about any fees or charges that you could incur with your loan. And by making you aware of this before you sign your agreement, it means that there's full transparency between you and the lender. Being able to settle your loan early is also an option if you want to do so. There's no minimum period to get through before you can do this, so you're able to settle at any time - 100% penalty free - even after just one single day. Making as many overpayments as you like without additional charges is also possible. If you do this at any point, your interest is recalculated and reduced according to the amount remaining, making your repayments smaller and more manageable. And the Car Cash Point interest rate is just 230% - almost half of some other log book loan lenders. If you own your car and it has no finance attached to it, Car Cash Point can offer you a flexible loan using it as security, allowing you to get a same-day cash loan when you need it most. You can even choose your repayment terms to suit your own finances - from monthly, 4-weekly, fortnightly or weekly. So try not to get drawn in by the dazzling offers that sound too good to be true. To take advantage of one of the best log book loans in the UK, contact Car Cash Point and see how they can help you. Visit www.carcashpoint.co.uk or call 0333 220 4419 today and find out for yourself why we're voted as 'Excellent' by our existing customers on TrustPilot.